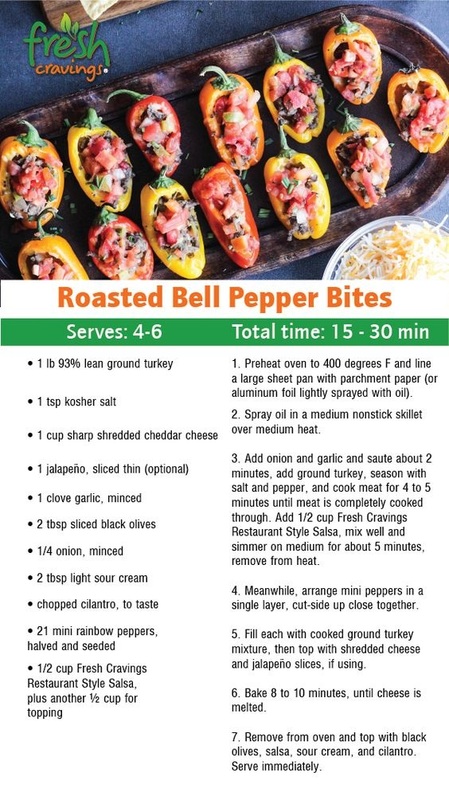 Serve as an appetizer or make a meal out of these delicious baby peppers loaded with ground turkey, cheese, sour cream, and salsa. Preheat oven to 400 degrees F and line a large sheet pan with parchment paper (or aluminum foil lightly sprayed with oil). 2Spray oil in a medium nonstick skillet over medium heat. 3Add onion and garlic and saute about 2 minutes, add ground turkey, season with salt and pepper, and cook meat for 4 to 5 minutes until meat is completely cooked through. Add 1/2 cup Fresh Cravings Restaurant Style Salsa, mix well and simmer on medium for about 5 minutes, remove from heat.